A research associate of the Australian National Maritime Museum, where he was a foundation staff member 1987–2014, Jeffrey has been visiting Indonesia since 1975 as a traveller, sailor and researcher. He has published widely on its diverse maritime traditions and speaks Bahasa Indonesia. From Wallace’s 1869 book The Malay Archipelago. Seafarer, maritime historian-ethnographer and Indonesian speaker, Jeffrey Mellefont, shares a lifetime’s knowledge of this beautiful archipelago, its peoples and seas. Sail on spacious Ombak Putih (‘White Wave’), a magnificent Bugis sail-trader outfitted in airconditioned luxury, with water-sports craft and all modern safety & navigation gear. Witness the spectacular seascape where four perfect volcanic-cone islands emerge in line from the sea, brilliant green and clad in clove plantations, right next to the Equator. Well-restored forts on Ternate and Tidore recall battles of the Spaniards, Portuguese, Dutch, English and local sultans to control the world trade in priceless cloves and nutmeg. Cross paths with Alfred Russel Wallace, whose famous ‘Letter from Ternate’ to Charles Darwin set out his own theory of evolution by natural selection. Sultan’s palaces, spirit houses and mosques of remote townships including Labuha, Sanana and Banggai, far off the tourist routes, recall isolated seaports of Joseph Conrad’s East Indies. At coastal Mantarara, accessible only by our ship, villagers welcome us with dance and betel nut – they had never seen a European until we first visited. Snorkel from ship’s tenders or off deserted white tropical beaches over abundant reefs of the Coral Triangle, which holds the world’s greatest diversity of marine life. Trek through lowland jungle in Eastern Sulawesi to encounter Indonesia’s last shamanist shifting agriculturalists, the Wana (‘forest’) people. Meet the sea gypsies, or Sama-Bajau people, recently settled on remote coral cays and stilt-hamlets over underwater reefs in the Padea Islands off S.E. Sulawesi. A gorgeous schooner from a bygone era, beautifully refitted, cruising tranquil waters! Our visits to isolated islands with fascinating histories provided an insight into Australia’s closest neighbour, whilst at the same time we shared beautiful Indonesian meals, snorkelling and the companionship of other ASA travellers in the expert hands of experienced and friendly guides and crew. An optimum blend of intellectual stimulation and total relaxation. Peter, VIC. This 12-day voyage on a traditional but luxuriously outfitted Indonesian sail-trader follows ancient monsoon sailing routes across the sheltered seas of Indonesia’s eastern archipelagos –visiting some of its remotest and loveliest islands and reefs. You board in Ternate, a spectacular island-volcano and seat of an historic spice sultanate. We visit Moluccan islands that were once the only place on earth where cloves grew. Surviving forts and palaces tell of rajahs and sultans and the Spanish, Portuguese, Dutch and English interlopers fighting to monopolise spices once worth their weight in gold. Crossing the wakes of explorers such as Magellan, Drake and Alfred Russel Wallace –including the island where he found that butterfly! – we traverse the truly remote Sula and Banggai Archipelagos. Far beyond the tourist trail, we meet diverse, welcoming maritime communities accessible only by sea and our ship’s tenders. They are just as curious to meet us. Reaching the fabled Celebes – Sulawesi – we encounter forests, wildlife and Indonesia’s last shamanist tribe, ending our cruise in the island port Kendari. All within the renowned Coral Triangle, where we snorkel amid the world’s greatest diversity of tropical marine life. Our voyage reveals the true nature of this island nation, an oceanic crossroads of seaborne trade, migration and cultures. Ombak Putih (‘White Wave’) is herself a part of this heritage. This story of rare spices, traders and explorers, adventurers and naturalists, slavers and pirates, ship builders and sea-gypsies is unfolded day by day by ASA’s guest lecturer, Jeffrey Mellefont. He works with the ship’s Indonesian cruise director and dive master, selected for their local knowledge of communities and natural history, and an attentive Indonesian ship’s crew, to look after all your needs. The Moluccas, Sula and Banggai archipelagos, along with Sulawesi, form a chain of largely volcanic islands on the Halmahera Plate within a geological ‘collision zone’, which accounts for current tectonic activity. Comprising well over a thousand islands, many of them sparsely populated, they are located in the transition zone known as Wallacea lieing to the east of the ‘Wallace Line’ that separates the two very different ecosystems of Asia and Australiasia. There can be no more exotic, isolated, yet historically significant groups of islands than the ‘Spice Islands’ (Moluccas) in the eastern Indonesian archipelago. Today they remain as remote and mysterious as they were to Europeans in the 16th century. They are situated off major transport routes, and little has changed in the lives of their peoples who harvest nutmeg and cloves in essentially the same way as they did 2,000 years ago. It was the same nutmeg and cloves, indigenous only to this island group and valued throughout the world like gold, that underpinned the Arab-controlled maritime ‘spice routes’. These trade routes distributed the spices to Europe and acted as the stimulus to Western Europe to develop the navigation systems and ships that undertook incredible voyages, to establish a continuous sea route in order to access eastern spice markets. This trade played a key role in the emergence of the first truly global economy, in which, for example, spices in the Moluccas could be paid for by silver mined in Mexico and carried east to the Philippines by the Spanish ‘Manila Galleons’. Over 400 years this trade raised the wealth of the world, was the focus of global conflicts, saw the transition from a stable trade based on the entrepôts of Malacca and Makassar, controlled by local sultanates, to an era of colonial conflict. The earlier phase saw a hectic mix of eastern traders using Malay as their ‘trading’ language whilst spreading Islam to the coastal East Indies. Western traders from the Iberian Peninsula destroyed this stable system when they conquered Malacca, took control of sea routes and established their own bases in the east. Far more successful were the Dutch, whose exploratory expedition in 1599, using Portuguese charts stolen by Jan Huyghen van Linschoten, determined that the Portuguese had only an unstable, tenuous control over the area and its trade. The Dutch formed the Dutch East India Company (Vereenigde Oostindische Compagnie – VOC) whose strategy was to displace the Spanish and Portuguese, to establish a major base at Batavia on the north coast of Java, to exert influence over the traditional entrepôts of Malacca and Makassar and, most importantly, to control completely the island sources of nutmeg and cloves. They formed alliances with the local sultanates and brutally replaced indigenous plantation workers with an imported workforce under Dutch masters; the VOC was responsible for the migration of some 1 million Europeans to the area. The commercial success of this strategy can best be understood in terms of an average annual dividend paid by the VOC to its shareholders of 18% for 200 years. Trade was broadened to include luxury goods that had sustained the ‘Silk Road’ from Xi’an to the Venetian and Genoese ports on the Black Sea. This was achieved from Batavia by following Portuguese patterns of trade with China at Macao and with Japan at Nagasaki. European imperial power struggles crystallised in the Seven Years War of the 1750s and the Napoleonic Wars. These led to a new order of international commerce and with a focus on colonisation and greater influence in the ‘Far East’ by England, which now dominated the world’s oceans. The English East India Company had, in fact, established a presence on the islands of Run and Ai, part of the ‘nutmeg island group’ in 1603. The Dutch overwhelmed these islands in 1620. Such was the value of the Banda Islands that following the Second Anglo – Dutch War, at the Treaty of Breda, the island of Run, first British colony in the region, was exchanged for the island of Manhattan. After the British defeated Napoleon they occupied the Dutch East Indies, leading to the migration of Moluccan clove and nutmeg production to British colonies such as Ceylon and Grenada. The East Indies were returned to the Dutch and remained their colony until Indonesian independence in 1945. Mohammad Hatta, intellectual catalyst for independence, was imprisoned by the Dutch on Moluccan Banda in the 1930s and it was here that he developed many nationalist ideas. Thus the Moluccas retained their pivotal role in world history right into the 20th century. Of equal importance were the travels of Alfred Wallace within the Indonesian-Malay Archipelago between 1854 and 1862 that led to two incredibly important ideas – evolution, and continental drift which formed the basis of our understanding of ‘plate tectonics’. His famous ‘Essay from Ternate’ (‘On the Tendency of Varieties to Depart Indefinitely from the Original Type’), sent to Charles Darwin in 1858, outlined his independent conclusions regarding evolution by natural selection. It was based largely on his observations in Sulawesi, the Moluccas and other islands that we will visit. Wallace contributed to later notions of plate tectonics through his observations of zoological ‘clustering’ either side of a line passing through the Indonesian archipelago (the ‘Wallace Line’), leading to the idea that ‘earth and life evolve together’. Our written itineraries must be approached with reasonable flexibility. When touring at sea, weather, currents, and even harbour masters don’t always co-operate with our planned itinerary, which sometimes make our planned schedules challenging or even impossible to carry out. Your tour leader and ship’s captain are always working hard to create an itinerary that best suits each situation and the needs of each guest onboard. Sometimes this means suggesting additional or alternative activities and destinations that they believe would be an improvement to your original itinerary. The flexibility to make these kinds of alterations (in addition to those due to circumstances beyond our control) in the best interests of all are part of the adventure. The tour price includes breakfast daily, lunches/picnics and evening meals indicated in the detailed itinerary where: B=breakfast, L=lunch/packed picnic and D=evening meal. Indonesia is known for its “jam karet” or rubber time, meaning that time and schedules are considered flexible. However, your Captain and Tour Leader will do their best to provide an accurate time schedule for land activities. Your Tour Leader will keep you updated on departure times and procedures. 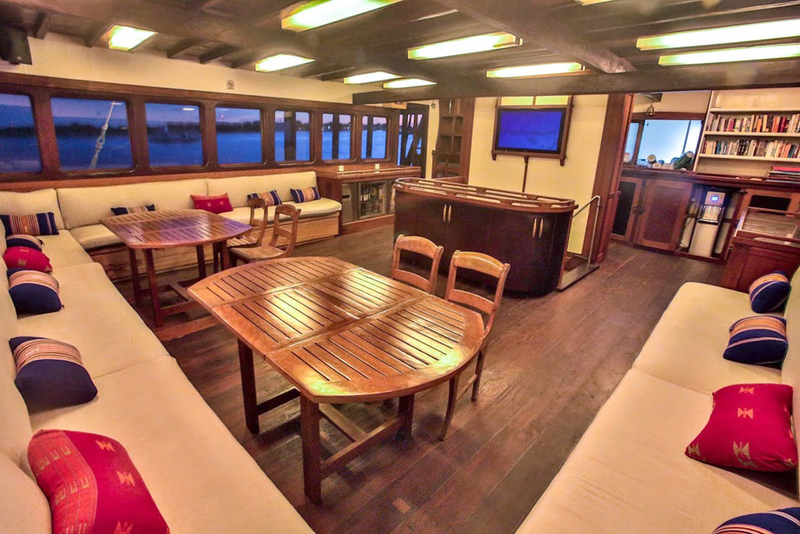 The Ombak Putih is a motor Bugis gaff ketch. 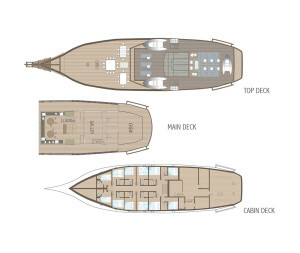 In order to adhere to our planned itinerary, the ship depends on motor cruising. The itinerary is scheduled so that the boat usually begins its longer journeys in the afternoon or during the night, so that you can fully enjoy land activities during the day. The seven beautiful sails are raised when it is beneficial, and the wind and weather are in our favour. Silk, Spice and Gunpowder – the world’s most ancient and valuable trade: how nutmeg and clove from Maluku drew traders from all over the world to explore and conquer, leading to the beginnings of globalisation and the first multi-national companies. Tanah Air Kita – Indonesia, this ‘land of water’, and the early mariners who burst out of mainland Asia to settle this huge, wide archipelago before conquering all the other adjacent oceans – and the brilliant sailing technologies they pioneered. Mighty Maritime Empires – how great Indonesian mercantile states arose through control of the Indonesian archipelago’s sea lanes, and fell in turn; how maritime trade brought currents of world history swirling through the islands introducing Buddhism, Hinduism, Islam and Christianity and the cultures of China, India, the Middle East and Europe. A Tapestry of Seafarers – Indonesia’s many different sailing cultures and their brilliant innovations – the Sea Gypsies (Sama-Bajo); the Madurese, the Mandar, the Butonese, the Bugis and Makassans – and Bali’s secret, hidden fleet! Celebes Ships – the story of our own ship Ombak Putih and her lineage, developing from the unique maritime traditions of the famous Bugis and Makassans of South Sulawesi, down the turbulent centuries as their sultans fought colonisers and their sailing fleets dispersed them throughout these islands. Great Guest Voyages – many Europeans have been inspired by Indonesian sailing traditions. Sail the Moluccas with Captain Thomas Forest on a native kora-kora in 1775; Alfred Russel Wallace searching for the bird of paradise on a Bugis prahu in 1856; colonial administrator G E P Collins ordering his own Celebes palari cruiser in the 1930s. The Best Language – Bahasa Indonesia: this fascinating, user-friendly language unites an incredibly diverse maritime world. The history of the language is a maritime history of this archipelagic nation. After this simple introduction you’ll be trying it out yourself ashore, with guidance, help and cheat-sheets at hand. After being met at Ternate Airport, or your hotel, you will be escorted to our ship, Ombak Putih, at her spectacular anchorage beneath towering Mt Gamalama (1715 metres). On board, you’ll be given a safety briefing and meet your fellow guests before going ashore to explore Ternate City. An overnight passage crosses the Equator and brings us to Labuha, a small port town in a perfectly sheltered bay on the island of Bacan. This is another seat of the historic Moluccan spice sultanates. Here, we can visit the Bacan Sultan’s kedaton or residence in a Dutch-colonial era mansion. Nearby Fort Barneveld, begun by the Portuguese in 1558 and recently restored, encapsulates turbulent colonial times. It was taken over by the Spanish who lost it in 1609 to the fleet of Dutch Vice-Admiral Simon Hoen in alliance with the Sultan of Ternate. The Dutch added the present four bastions and renamed it Barneveld. We stroll riverside promenades where a picturesque footbridge is paved with famous Bacan green-stone, a lovely colour-changing gemstone known as chrysocolla chalcedony. With luck we’ll find it for sale as affordable jewellery from street vendors on our way to the vibrant seafood and produce market. In a forest at the edge of town live some rare black macaques – the only monkey species this side of the Wallace Line, introduced from North Sulawesi. Anchored off the deserted, white-sand Belang-Belang Island, we spend the morning swimming, snorkelling crystal waters or playing on the ship’s paddle boards and kayaks. Today we reach the truly remote Sula Archipelago, where we are least likely to encounter a single foreign visitor! These untouched islands are the cultural crossroads of Maluku and Sulawesi. In the past, the Sula archipelago was controlled by the Ternate Sultanate, and the southernmost of its three main islands, Sulabesi, became a port of call for spice traders. Going ashore at the capital, Sanana, we land in a colourful port where sail-traders still anchor. We can expect a touching ritual greeting as honoured guests, and a welcome with local spiced coffee, tea and snacks. Impressive Fort de Verwachting, with its history of renovations and name changes starting in 1623, has four bastions, two watch towers and a wall-top walkway around the parapet. Malay inscriptions in an ancient script indicate its use by the Moluccan sultanates as well as Dutch forces. There’s a startling modern mosque, the biggest in Eastern Indonesia, with a back-story that will amaze. We pass our first sea-gypsy village on the way to a picturesque bamboo walkway through a tidal mangrove forest. Cruising along the southern shore of Mangoli Island, we reach Taliabu Island where we go ashore at the small Muslim village of Waikoka. The entire village takes an interest, and young and old will most likely accompany us. Usually we present textbooks to the isolated village primary school. This village was hit by a tsunami in 1999 and many of the residents relocated inland. We reach the new settlement by a picturesque path winding through extensive groves of the tallest coconut trees you’ve ever seen, and can inspect the copra production which, along with fishing, is the economic mainstay. Entering the region of Sulawesi, we spend the day at charming Mbuang-Mbuang in the Bokan Islands of the south-east Banggai archipelago. This area is known as the ‘Raja Ampat of Banggai’ for its beautiful island landscapes, caves, beaches, lakes and coral reefs. A highlight of our snorkelling here is the spectacular underwater conservatory of giant clams with iridescent colours, protected by the fishermen who welcome us to their tidy village built over white sand and turquoise waters. It’s the region’s first entirely solar-powered community. We spend our second day in the scenic Banggai group of islands, small and large, remote and very little-known. Banggai’s main port is a lively hub for colourful interisland ferries. Here we enjoy a tour in chartered bentor – raffish two-passenger motorcycle rickshaws that will turn heads as our flotilla of foreigners motors through town. Visits include a bustling market and the modest timber palace of the local sultan, guarded by two ancient, weathered Portuguese cannon. We’re escorted to an unusual rumah keramat or sacred community house near ancestral, royal burial grounds where a megalithic stone sarcophagus has recently been unearthed. Revered elders guard this ‘spirit house’ and its pre-Islamic rituals and cult objects – co-existing with the mainstream mosques of this Muslim port town. A big day. After breakfast we explore Umbele Island in the Salabengka archipelago, home to cheerful Butonese, Buginese and Bajau (sea gypsy) migrants… you will never have been asked to pose for so many selfies. With luck we can see more exquisite little Banggai cardinal fish hovering in groups in clear seawater around their stilt houses. Endemic to this region off central Sulawesi, they may soon be gone from the wild because of demand from the world’s aquarium trade. Cruising down the mountainous eastern shore of Sulawesi over lunch, we reach the isolated Padea Islands and visit the coral cay Samaringa to meet those famed sea-gypsies, the Sama-Bajau. Last of the true marine nomads, for centuries they belonged to no nation and lived afloat from birth to death. In recent times governments pressured them to settle: on uninhabited scraps of islands, often building their stilt-houses over tidal zones or even on offshore reefs. Yet our good-humoured hosts are still exclusively sea people, fishing, reef-gathering, farming seaweed, harvesting sea cucumbers or trochus pearl-shell, and boat building. Today we reach Kendari, the busy port city that is the capital of South-East Sulawesi province. These are the homelands of the Butonese mariners whose boats fill this busy harbour along with those of their neighbouring Sulawesi seafarers, the Mandar, Buginese and Makassarese. The harbour is developing fast, and is now famous for its huge new floating mosque. 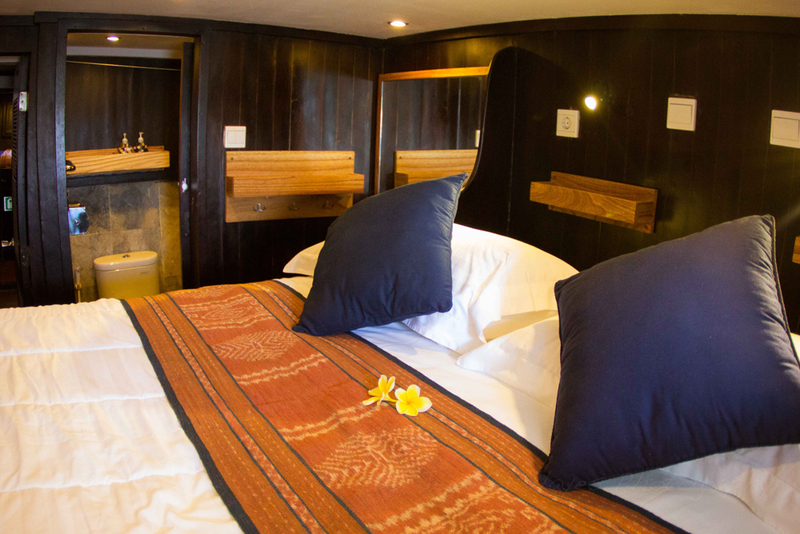 Each cabin contains a private toilet, a hot/cold water shower and locally produced shampoo and soap. The Ombak Putih provides a modern marine toilet system, which functions just like any western toilet. 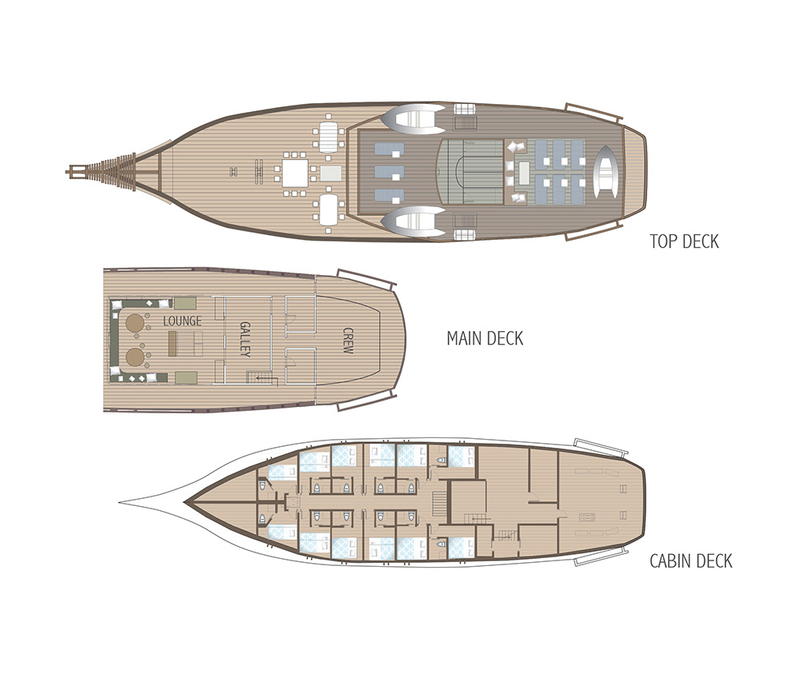 Each cabin has an individually controlled air-conditioning unit. Each room is equipped with an electrical outlet suitable for round, 2-pinned European plugs that are compatible with 220 Electric Voltage. The salon has additional sockets for charging, and a large power strip that accepts most plug styles. Additional adaptors are available onboard. Beach and bath towels are provided for each guest. In order to conserve water, bath towels will be changed after 3 days and beach towels will be changed after 5 days. Bed linen is changed mid-trip. There is a small safe in the Captain’s cabin for stowage of your valuables or documents should you need it. There is a lockable cabinet in each cabin that may be secured with your personal luggage lock. A limited laundry service is available to guests, free of charge. To conserve water, guests are limited to two pieces per day. A satellite phone is available for passengers on board for a fee of US$ 3.00 per minute for international calls and US$ 1.00 per minute for local calls. Local mobile phone signal may be available at certain times during your trip. Internet access is NOT available on board ship, however you may be able to access the internet via your mobile phone when the Ombak Putih arrives at port (the speed of internet connection may vary). 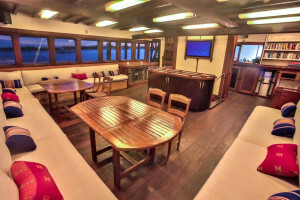 Meals can be taken either in the salon or on the open air dining area on the foredeck. A breakfast buffet is offered in the salon between 7:00 and 9:30, or before the morning’s land excursions, while lunch and dinner times are announced by the salon bell. Between meals local fruit, crackers, biscuits and assorted nibbles are made available at the bar. The Ombak Putih offers a fresh, healthy menu full of local specialties that should suit the varied tastes of our guests. The crew sources the freshest local fruits, vegetables, and fish available and a trip to the local market with them can be real adventure. If you have any dietary preferences or restrictions, please advise ASA well in advance of your trip. Coffee, cocoa and a variety of teas, as well as soft drinks and fruit juice are all complimentary and available at any time. Wine and spirits are heavily taxed in Indonesia, therefore generally fairly expensive by international standards. The bar menu offers a limited selection of imported and local wines as well as a range of spirits and delicious cocktail creations at reasonable prices. Alcoholic beverages are provided at an additional charge to our guests. You should feel free to bring your own favourite beverages. Although we sometimes cross channels that provide us with some exciting waves, most of your cruise should experience calm seas and sunny days. Your Tour Leader will usually arrange most essentials for your land excursions, however, a bottle of water, a hat, sunscreen and insect repellent are items you should bring with you at all times. Don’t forget your camera (with charged batteries and ample memory) as well as some money for souvenirs if you wish. Flip-flops or sandals are usually sufficient footwear for most land tours, but in some cases sturdier shoes, sports sandals, or water booties might be more appropriate. Landings on shore from the tenders may be either dry or wet due to fluctuations in tidal levels. In the case of a wet landing, water might come as high as the knees, therefore suitable sandals or carrying your shoes to be put on upon land (as well as rolled up pants or shorts) might be recommended. Your Tour Leader will try to make recommendations for appropriate footwear for each occasion. In the streets of Jakarta or the tourist areas of Bali, revealing clothing may be more socially accepted, but many of the remote villages we visit are accustomed to more conservative dress. In order to both respect our hosts and not draw uncomfortable attention, we usually suggest more conservative clothing when touring a village. This means that ladies should avoid plunging necklines and bare shoulders while both sexes should cover the knees. On board you can feel comfortable in your swimwear as our crew is used to this, however a revealing bathing costume might cause offence in the vicinity of a village. Exploring the underwater world is a highlight of any trip. Snorkelling equipment is made readily available on board. At the end of your cruise, you can pay for additional purchases and your bar bill with cash (Indonesian Rupiah or major foreign currency at the current exchange rates) or credit card (Seatrek only accepts VISA). Please complete the ASA RESERVATION APPLICATION and send it to Australians Studying Abroad together with your non-refundable deposit of AUD $2500.00 per person payable to Australians Studying Abroad. 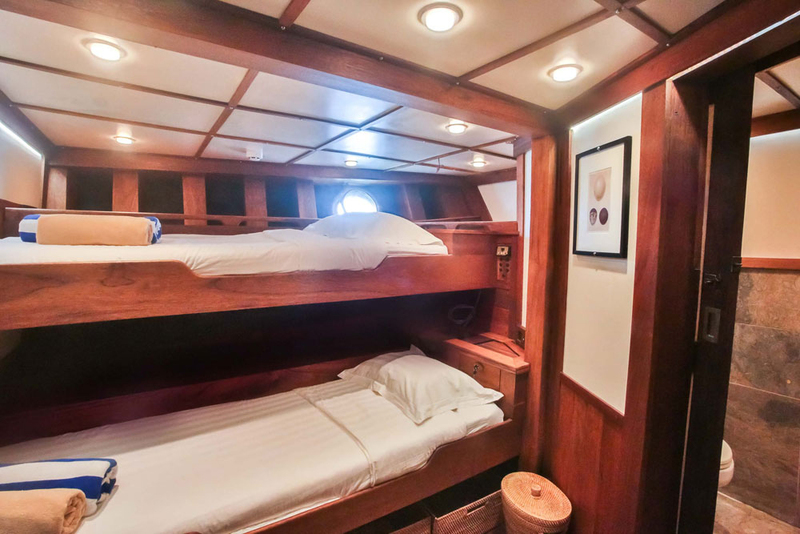 11 nights cruising aboard the Ombak Putih involving motoring and sailing on open water from Ternate to Kendari. A moderate amount of walking where many of the sites are large and unsheltered. Visiting sites where you will encounter steps, rocky and uneven ground, slopes. Activities include swimming, snorkelling, village walks and rainforest treks. Please ensure that all necessary travel documents are valid and effective and in your possession. Passports are required for all participants and MUST be valid for at least 6 months after your date of return. Please assume full responsibility for checking and verifying any and all passport, visa, vaccination, or other entry requirements. We may provide information or advice on general matters such as climate, clothing, baggage, and special equipment in good faith as a courtesy to you, however, please ensure that you are properly prepared. This trip has varying levels of demands and fitness requirements. To participate, you must complete the ASA Reservation Application Form. Medical care beyond basic first aid, due to the often remote regions visited, is often not immediately available. If you have a physical, dietary, or other condition for which you may desire special attention, please inform us in writing when the booking is made. ASA and SeaTrek assumes no responsibility for any medical care provided to you. The price for this tour is given in USD. Based on the current exchange rates (1AUD = .70USD), this is approximately $10,357.00 AUD. The final tour price will be confirmed 4 months prior to departure. Note: due to the limited number of cabins available on the Ombak Putih, cabins for single use are not currently being offered. If you are interested in this option please contact ASA for further information. A non-refundable deposit of $2500.00 AUD per person is required upon reservation. We take the day on which you cancel as being that on which we receive written confirmation of cancellation. If the number of participants on a tour is significantly less than budgeted, or if there is a significant change in exchange rates ASA reserves the right to amend the advertised price. We shall, however, do all in our power to maintain the published price. We reserve the right to cancel, alter or modify this tour without prior notice for the safety and/or comfort of clients due to local circumstances or events. On rare occasions, a tour cancellation may occur in which case a full refund will be issued to you less any airline ticket cancellation fees and non-refundable deposits. This will constitute full settlement of claims you may have arising out of our cancellation. SeaTrek and ASA will not be deemed in breach of this agreement by reason of delay in performance or nonperformance of any of its obligations under this agreement to the extent that any such delay or nonperformance is due to any Force Majeure. “Force Majeure” means any circumstances beyond the reasonable control of SeaTrek or ASA. ASA requires all participants to obtain comprehensive travel insurance. A copy of your travel insurance certificate and the reverse charge emergency contact phone number must be received by ASA no later than 95 days prior to the commencement of the tour. The balance of the tour price will be due 95 days prior to the tour commencement date. A graduate of the University of Sydney, Jeffrey Mellefont is an honorary research associate of the Australian National Maritime Museum, where he was a foundation research consultant and then had a long career as a publisher and editor (1988–2014). He established and edited the museum’s quarterly journal Signals and still writes for it. Formerly a blue-water mariner, celestial navigator and professional yacht captain, Jeffrey became a specialist marine writer and photographer and has made a lifetime study of the fascinating maritime world of Asia and in particular of Indonesia. He has published extensively on these subjects in both popular and academic journals. Jeffrey has been visiting Indonesia since 1975 when he was immediately drawn into the maritime life of this tropical archipelago with its extraordinarily diverse cultures and history – as well as the study of Bahasa Indonesia, a national language with its roots in the ancient world of sailors and seaborne traders. He has also traversed the archipelago, west to east, by yacht. Jeffrey has shared his knowledge and enthusiasm for this oceanic world by leading tour groups exploring maritime themes in Indonesia, Cambodia and India, both for the Australian National Maritime Museum and for maritime tourism operators. His richly illustrated presentations draw upon decades of research and adventures sailing with the traditional seafarers and boat builders of Indonesia.